Another product from automobile giant Volkswagen Commercial Vehicles is VW Amarok, the entry pickup model for this brand. It was introduced in 2010 and depending on the market it is available in single cab and double cab configurations. Like all VW’s vehicles, the Amarok features good build quality but also slightly higher prices than some rival models. The model offers two diesel engine options and while it lags behind some rivals on capacity it wins in terms of power and fuel economy. It comes in rear wheels drive configuration but it also offers selectable or permanent four-wheel drive models which are more suitable for those who want this model as working truck or need enhanced off-road ability. Some Amarok models are available with Bluemotion technology which promises improved fuel efficiency. On the other hand, this pickup truck is one of the largest vehicles in its class and offers one off the widest cargo beds. Where this model is also in the top end among the rivals is ride quality where its handling and comfort can be compared with more passenger oriented vehicles. The model also offers wide range of models which covers everything from base work truck versions to well-equipped dual cabs. 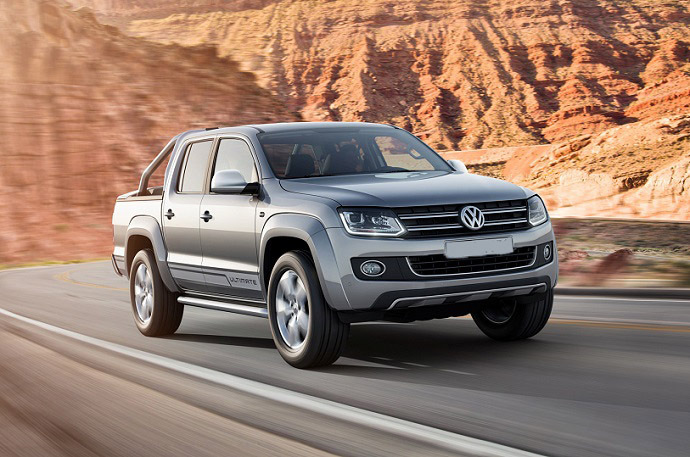 The 2016 VW Amarok is faced with rivals like Nissan Navara, Mitsubishi L200 and others. On the performance front, the 2016 VW Amarok comes with two 2.0 liter diesel engine options, two transmissions and with two or four wheel drive. The most of its rivals are equipped with larger displacements or even V-6 engines but despite Amarok achieves to follow other traffic even with less powerful engine option. The entry level engine is 2.0 liter TDI four-cylinder displacement available with standard six-speed manual gearbox and selectable 4Motion drive system. This engine develops 140 PS (138 Hp) at 3,750 rpm and torque of 340 Nm at 1,750 to 2,250 rpm. For drivers which demand better performance Amarok can be equipped with also 2.0 liter but BiTDI engine which produces 180 PS (177 Hp) at 4,000 rpm and torque of 400 Nm with manual gearbox or 420 Nm with automatic transmission. This amount of power is more than enough for the most of situations and it also delivers swift acceleration and more relaxed on road driving. This engine is also standard with a six-speed manual and optional with an eight-speed transmission and the same case is with selectable 4Motion which is standard while permanent 4Motion is optional but only in combination with automatic shifter. All 4Motion Amaroks also feature low-range gearing and rear differential lock which helps it to attack tough surfaces and terrains. BlueMotion Technology can be found on 2.0BiTDI automatic versions and it brings enhancements like stop/start system, regenerative braking, low-resistance tires which all should rise efficiency on the higher level. In terms of the fuel efficiency, VW promises up to 36.2 mpg for some configurations with TDI engine and manual gearbox while BiTDI and manual combo return up to 35.3 mpg. VW claims that configuration with an 8-speed shifter doesn’t have an effect to the fuel economy. When it comes to what ute is made for, hauling and towing, the Amarok allows payload up to 1.091 kg while towing capacity is up to 3,000 kg for the most versions except permanent 4Motion BiTDI automatic variant which allows up to 3,200 kg. The ride is well-composed and among the best in class. Handling and steering is good and Amarok’s behave is predictable while riding. If comfort is a higher priority models with permanent 4Motion include softer suspension which handles bumps better. It is also more than ready to attack off-road terrains thanks to available equipment. The styling of the 2016 VW Amarok isn’t something what you wouldn’t expect from VW. It blends rugged pickup style with SUV cues and neat German’s details. Up front is familiar VW’s grille treatment and attractive headlights. The model looks good from the profile side as well thanks to chunky, flared fenders, effective recess in door panels just above sills and good proportions. The model is also one of the largest in its class what also stands for load area which covers more than 2, 5 square meters. Behind the steering wheel it truly provides car-like feel. It is very practical and very comfortable inside. The front seats are comfortable and supportive and they offer adjustment functionality which is also available for the steering wheel. The dual cab configuration offers plenty of space for rear passengers as well. The equipment level in generous even in base versions. The dash is broad and its design may seem simple and polarizing but it includes large, easy to use controls and buttons. Instrument cluster includes analog gauges which are easy to read. The VW Amarok is available in single cab and dual cab configurations. The model also comes with rear-wheel drive and selectable or permanent four-wheel drive. The range also varies between basic work trucks to top-equipped dual cab models. All models include air conditioning, height adjustment for the front seats, USB and auxiliary inputs, Bluetooth connectivity, a 12-volt outlet on the center console. It also offers daytime running lights, rear parking sensors, four airbags, trailer sway control, electronic stability and traction control. 4WD versions are equipped with rear differential lock. The base Single Cab and Dual cab models ride on 16 inch wheels. More expensive Dual Cab 4WD Core models include aluminum made wheels. The next level Trendline models add fog lights, front parking sensors, 17-inch alloy wheels, and more 12-volt outlets. This trim also includes a 5-inch multi-functional trip computer, two zone automatic air-conditioning, a six-speed sound system, leather wrapped steering wheel, cruise control. Move up to the Highline trim and there will also be touch screen, navigation, heated front seats, leather upholstery, rear privacy glass, rearview camera. These trim models also feature 18-inch wheels, side steps, and behind cab sports bar. The Ultimate versions ride on 19-inch wheels. VW also has limited edition Amarok models like Atacama and Canyon which are based on the Highline trim. The Amarok is also one of the safest picks in its class and its safety equipment additionally to mentioned features include standard ESP with ABS with off-road function, hill descant assist and hill start assist. The 2016 VW Amarok is certainly one of the best options in its class. It is tough, comfortable with almost car like manners and also efficient and capable for serous off-road ride. The price range for this model begins from around $31,500 for base version while top models goes for around $64,000.